The C140B 14" Cross Strap Patio Chaise Lounge is a versatile commercial outdoor lounge with a 14 inch seat height and armless design. 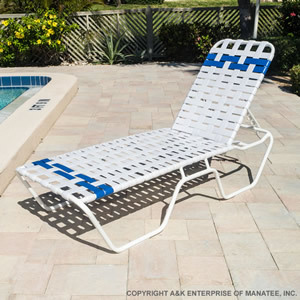 Made specifically for commercial use, the C140B 14" Cross Strap Patio Chaise Lounge is stackable, has a powder-coated frame, and comes with a commercial outdoor warranty. The 2" vinyl straps are double-wrapped and woven into a basketweave pattern for unique styling. Featuring under the seat braces, a top position default and pinch proof headrest, the C140B 14" Cross Strap Patio Chaise Lounge is the ultimate outdoor chaise. Customize yours today!